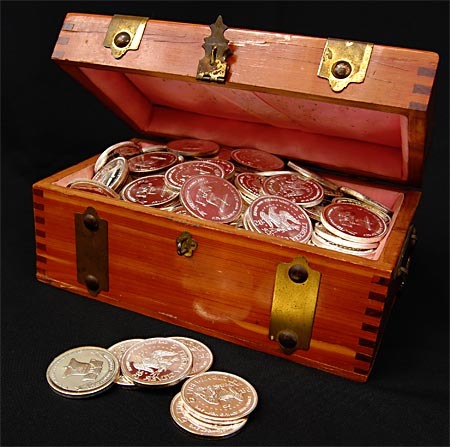 old coins and ornaments of gold and silver. "Again, the kingdom of heaven is like unto treasure hid in a field; the which when a man hath found, he hideth, and for joy thereof goeth and selleth all that he hath, and buyeth the field." In ancient times it was customary for men to hide their treasures in the earth. Thefts and robberies were frequent. And whenever there was a change in the ruling power, those who had large possessions were liable to be put under heavy tribute. Moreover the country was in constant danger of invasion by marauding armies. As a consequence, the rich endeavored to preserve their wealth by concealing it, and the earth was looked upon as a safe hiding place. But often the place of concealment was forgotten; death might claim the owner, imprisonment or exile might separate him from his treasure, and the wealth he had taken such pains to preserve was left for the fortunate finder. In Christ's day it was not uncommon to discover in neglected land old coins and ornaments of gold and silver. A man hires land to cultivate, and as the oxen plow the soil, buried treasure is unearthed. As the man discovers [p. 104] this treasure, he sees that a fortune is within his reach. Restoring the gold to its hiding place, he returns to his home and sells all that he has, in order to purchase the field containing the treasure. His family and his neighbors think that he is acting like a madman. Looking on the field, they see no value in the neglected soil. But the man knows what he is doing; and when he has a title to the field, he searches every part of it to find the treasure that he has secured. This parable illustrates the value of the heavenly treasure, and the effort that should be made to secure it. The finder of the treasure in the field was ready to part with all that he had, ready to put forth untiring labor, in order to secure the hidden riches. So the finder of heavenly treasure will count no labor too great and no sacrifice too dear, in order to gain the treasures of truth. In the parable the field containing the treasure represents the Holy Scriptures. And the gospel is the treasure. The earth itself is not so interlaced with golden veins and filled with precious things as is the word of God. The treasures of the gospel are said to be hidden. By those who are wise in their own estimation, who are puffed up by the teaching of vain philosophy, the beauty and power and mystery of the plan of redemption are not perceived. Many have eyes, but they see not; they have ears, but they hear not; they have intellect, but they discern not the hidden treasure. A man might pass over the place where treasure had been concealed. In dire necessity he might sit down to rest at the foot of a tree, not knowing of the riches hidden [p. 105] at its roots. So it was with the Jews. As a golden treasure, truth had been intrusted to the Hebrew people. The Jewish economy, bearing the signature of Heaven, had been instituted by Christ Himself. In types and symbols the great truths of redemption were veiled. Yet when Christ came, the Jews did not recognize Him to whom all these symbols pointed. They had the word of God in their hands; but the traditions which had been handed down from generation to generation, and the human interpretation of the Scriptures, hid from them the truth as it is in Jesus. The spiritual import of the sacred writings was lost. The treasure house of all knowledge was open to them, but they knew it not. God does not conceal His truth from men. By their own course of action they make it obscure to themselves. Christ gave the Jewish people abundant evidence that He was the Messiah; but His teaching called for a decided change in their lives. They saw that if they received Christ, they must give up their cherished maxims and traditions, their selfish, ungodly practices. It required a sacrifice to receive changeless, eternal truth. Therefore they would not admit the most conclusive evidence that God could give to establish faith in Christ. They professed to believe the Old Testament Scriptures, yet they refused to accept the testimony contained therein concerning Christ's life and character. They were afraid of being convinced lest they should be converted and be compelled to give up their preconceived opinions. The treasure of the gospel, the Way, the Truth, and the Life, was among them, but they rejected the greatest gift that Heaven could bestow. "Among the chief rulers also many believed on Him," we read; "but because of the Pharisees they did not confess [p. 106] Him, lest they should be put out of the synagogue." John 12:42. They were convinced; they believed Jesus to be the Son of God; but it was not in harmony with their ambitious desires to confess Him. They had not the faith that would have secured for them the heavenly treasure. They were seeking worldly treasure. And today men are eagerly seeking for earthly treasure. Their minds are filled with selfish, ambitious thoughts. For the sake of gaining worldly riches, honor, or power, they place the maxims, traditions, and requirements of men above the requirements of God. From them the treasures of His word are hidden. "The natural man receiveth not the things of the Spirit of God; for they are foolishness unto him; neither can he know them, because they are spiritually discerned," 1 Cor. 2:14. "If our gospel be hid, it is hid to them that are lost; in whom the god of this world hath blinded the minds of them which believe not, lest the light of the glorious gospel of Christ, who is the image of God, should shine unto them." 2 Cor. 4:3, 4. The value of this treasure is above gold or silver. The riches of earth's mines cannot compare with it. For the price of wisdom is above rubies." This is the treasure that is found in the Scriptures. The Bible is God's great lesson book, His great educator. The foundation of all true science is contained in the Bible. Every branch of knowledge may be found by searching the word of God. And above all else it contains the science of all sciences, the science of salvation. The Bible is the mine of the unsearchable riches of Christ. The true higher education is gained by studying and obeying the word of God. But when God's word is laid aside for books that do not lead to God and the kingdom of heaven, the education acquired is a perversion of the name. There are wonderful truths in nature. The earth, the sea, and the sky are full of truth. They are our teachers. Nature utters her voice in lessons of heavenly wisdom and eternal truth. But fallen man will not understand. Sin has obscured his vision, and he cannot of himself interpret nature without placing it above God. Correct lessons cannot impress the minds of those who reject the word of God. The teaching of nature is by them so perverted that it turns the mind away from the Creator. By many, man's wisdom is thought to be higher than the wisdom of the divine Teacher, and God's lesson book is [p. 108] looked upon as old-fashioned, stale, and uninteresting. But by those who have been vivified by the Holy Spirit it is not so regarded. They see the priceless treasure, and would sell all to buy the field that contains it. Instead of books containing the suppositions of reputedly great authors, they choose the word of Him who is the greatest author and the greatest teacher the world has ever known, who gave His life for us, that through Him we might have everlasting life. Satan works on human minds, leading them to think that there is wonderful knowledge to be gained apart from God. By deceptive reasoning he led Adam and Eve to doubt God's word, and to supply its place with a theory that led to disobedience. And his sophistry is doing today what it did in Eden. Teachers who mingle the sentiments of infidel authors with the education they are giving, plant in the minds of youth thoughts that will lead to distrust of God and transgression of His law. Little do they know what they are doing. Little do they realize what will be the result of their work. A student may go through all the grades of the schools and colleges of today. He may devote all his powers to acquiring knowledge. But unless he has a knowledge of God, unless he obeys the laws that govern his being, he will destroy himself. By wrong habits he loses his power of self-appreciation. He loses self-control. He cannot reason correctly about matters that concern him most closely. He is reckless and irrational in his treatment of mind and body. By wrong habits he makes of himself a wreck. Happiness he cannot have; for his neglect to cultivate pure, healthful principles places him under the control of habits that ruin his peace. His years of taxing [p. 109] study are lost, for he has destroyed himself. He has misused his physical and mental powers, and the temple of the body is in ruins. He is ruined for this life and for the life to come. By acquiring earthly knowledge he thought to gain a treasure, but by laying his Bible aside he sacrificed a treasure worth everything else. The word of God is to be our study. We are to educate our children in the truths found therein. It is an inexhaustible treasure; but men fail to find this treasure because they do not search until it is within their possession. Very many are content with a supposition in regard to the truth. They are content with a surface work, taking for granted that they have all that is essential. They take [p. 110] the sayings of others for truth, being too indolent to put themselves to diligent, earnest labor, represented in the word as digging for hidden treasure. But man's inventions are not only unreliable, they are dangerous; for they place man where God should be. They place the sayings of men where a "Thus saith the Lord" should be. Christ is the truth. His words are truth, and they have a deeper significance than appears on the surface. All the sayings of Christ have a value beyond their unpretending appearance. Minds that are quickened by the Holy Spirit will discern the value of these sayings. They will discern the precious gems of truth, though these may be buried treasures. Human theories and speculations will never lead to an understanding to God's word. Those who suppose that they understand philosophy think that their explanations are necessary to unlock the treasures of knowledge and to prevent heresies from coming into the church. But it is these explanations that have brought in false theories and heresies. Men have made desperate efforts to explain what they thought to be intricate scriptures; but too often their efforts have only darkened that which they tried to make clear. The priests and Pharisees thought they were doing great things as teachers by putting their own interpretation upon the word of God, but Christ said of them, "Ye know not the scriptures, neither the power of God." Mark 12:24. He charged them with the guilt of "teaching for doctrines the commandments of men." Mark 7:7. Though they were the teachers of the oracles of God, though they were supposed to understand His word, they were not doers of the word. Satan had blinded their eyes that they should not see its true import. This is the work of many in our day. Many churches are guilty of this sin. There is danger, great danger, that the supposed wise men of today will repeat the experience [p. 111] of the Jewish teachers. They falsely interpret the divine oracles, and souls are brought into perplexity and shrouded in darkness because of their misconception of divine truth. The Scriptures need not be read by the dim light of tradition or human speculation. As well might we try to give light to the sun with a torch as to explain the Scriptures by human tradition or imagination. God's holy word needs not the torchlight glimmer of earth to make its glories distinguishable. It is light in itself—the glory of God revealed, and beside it every other light is dim. But there must be earnest study and close investigation. Sharp, clear perceptions of truth will never be the reward of indolence. No earthy blessing can be obtained without earnest, patient, persevering effort. If men attain success in business, they must have a will to do and a faith to look for results. And we cannot expect to gain spiritual knowledge without earnest toil. Those who desire to find the treasures of truth must dig for them as the miner digs for the treasure hidden in the earth. No halfhearted, indifferent work will avail. It is essential for old and young, not only to read God's word, but to study it with wholehearted earnestness, praying and searching for truth as for hidden treasure. Those who do this will be rewarded, for Christ will quicken the understanding. Men of piety and talent catch views of eternal realities, but often they fail of understanding, because the things that are seen eclipse the glory of the unseen. He who would seek successfully for the hidden treasure must rise to higher pursuits than the things of this world. His affections and all His capabilities must be consecrated to the search. Disobedience has closed the door to a vast amount of knowledge that might have been gained from the Scriptures. Understanding means obedience to God's commandments. The Scriptures are not to be adapted to meet the prejudice and jealousy of men. They can be understood only by those who are humbly seeking for a knowledge of the truth that they may obey it. Do you ask, What shall I do to be saved? You must lay your preconceived opinions, your hereditary and cultivated ideas, at the door of investigation. If you search the Scriptures to vindicate your own opinions, you will never reach the truth. Search in order to learn what the Lord says. If conviction comes as you search, if you see that your cherished opinions are not in harmony with the truth, do not misinterpret the truth in order to suit your own belief, but accept the light given. Open mind and heart that you may behold wondrous things out of God's word. Faith in Christ as the world's Redeemer calls for an acknowledgment of the enlightened intellect controlled by a heart that can discern and appreciate the heavenly treasure. This faith is inseparable from repentance and transformation of character. To have faith means to find and accept the gospel treasure, with all the obligations which it imposes. "Except a man be born again, he cannot see the kingdom of God." John 3:3. He may conjecture and imagine, but without the eye of faith he cannot see the treasure. Christ gave His life to secure for us this inestimable [p. 113] treasure; but without regeneration through faith in His blood, there is no remission of sins, no treasure for any perishing soul. We need the enlightenment of the Holy Spirit in order to discern the truths in God's word. The lovely things of the natural world are not seen until the sun, dispelling the darkness, floods them with its light. So the treasures in the word of God are not appreciated until they are revealed by the bright beams of the Sun of Righteousness. The Holy Spirit, sent from heaven by the benevolence of infinite love, takes the things of God and reveals them to every soul that has an implicit faith in Christ. By His power the vital truths upon which the salvation of the soul depends are impressed upon the mind, and the way of life is made so plain that none need err therein. As we study the Scriptures, we should pray for the light of God's Holy Spirit to shine upon the word, that we may see and appreciate its treasures. No one can search the Scriptures in the spirit of Christ without being rewarded. When man is willing to be instructed as a little child, when he submits wholly to God, he will find the truth in His word. If men would be obedient, they would understand the plan of God's government. The heavenly world would open its chambers of grace and glory for exploration. Human beings would be altogether different from what they now are, for by exploring the mines of truth men would be ennobled. The mystery of redemption, the incarnation of Christ, His atoning sacrifice, would not be as they are now, vague in our minds. They would be not only better understood, but altogether more highly appreciated. In His prayer to the Father, Christ gave to the world a lesson which should be graven on mind and soul. "This is life eternal," He said, "that they might know Thee the only true God, and Jesus Christ, whom Thou hast sent." John 17:3. This is true education. It imparts power. The experimental knowledge of God and of Jesus Christ whom He has sent, transforms man into the image of God. It gives to man the mastery of himself, bringing every impulse and passion of the lower nature under the control of the higher powers of the mind. It makes its possessor a son of God and an heir of heaven. It brings him into communion with the mind of the Infinite, and opens to him the rich treasures of the universe. This is the knowledge which is obtained by searching the word of God. And this treasure may be found by every soul who will give all to obtain it. "If thou criest after knowledge, and liftest up thy voice for understanding; if thou seekest her as silver, and searchest for her as for hid treasures; then shalt thou understand the fear of the Lord, and find the knowledge of God." Prov. 2:3-5. Click here to read the next chapter: "The Pearl"